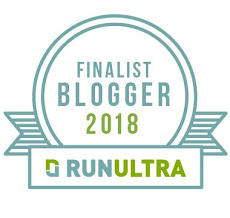 Normally, I do the running around here, and while I know you all have come to rely on Lexi for nutritional guidance, I like to think I hold up my end of this blog with race reports and thoughts on the sport that are at least mildly entertaining. But now it seems even this small niche has been co-opted. As vibrant as local scene is in New Paltz, in terms of outdoor sports trail running is a distant third behind rock climbing and triathlon locally. And among local tri-geeks, the biggest race on the calendar is by far the Survival of the Shawangunks. 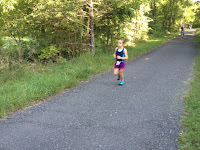 Having just completed its twenty-sixth running, the SOS is a multistage triathlon that basically involves swimming the three lakes of the Shawangunk ridge and running the trails in between--a bike-run-swim-run-swim-run-swim-run. It's a nationally known event that attracts elites from all over the country and also the best the local competition has to offer. In the past few years the race organizers have added a kids' race, which this year took place the day before. 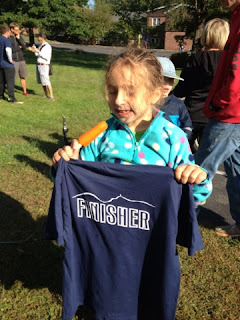 It was the first year Lexi was old enough to run. 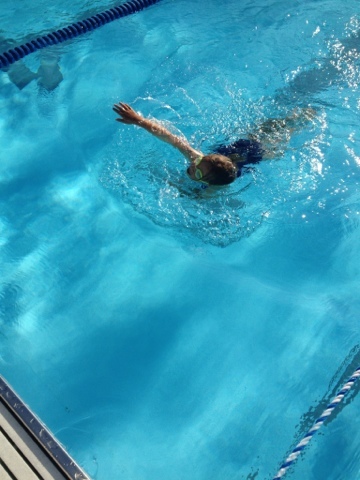 She went into this summer without any real swimming background--or ability--but worked hard on learning the crawl this summer and even joined my for a mile or so of running here and there, mostly home from art class on Thursday afternoons in late spring. I will say that watching her race, and especially waiting for her to start, was orders of magnitude more stressful for me than any pre-race jitters I've ever had in my life. I'll also say that I was more proud of her effort and her finish than of any result I've ever had. Anyway, take it away, Lex. 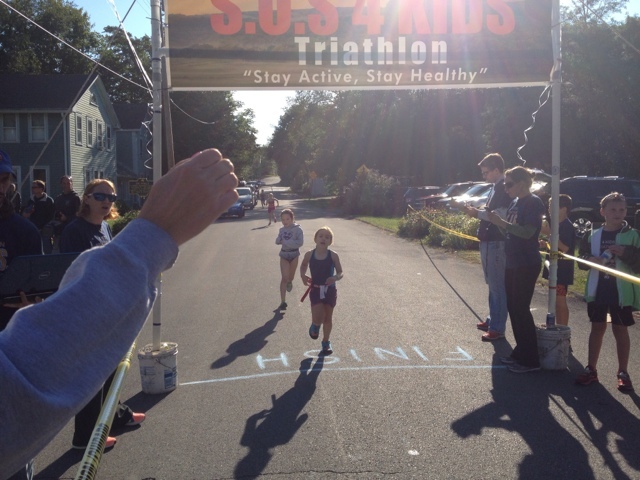 The SOS4Kids is a triathlon for kids that is a mini-version of the SOS triathlon, which is a big race in New Paltz. You can only run if you are 7, 15, or in between. This was my first triathlon. When I started, I felt excited and happy that the water was warm! But also, I was worried that I would be one of the last ones in the race. 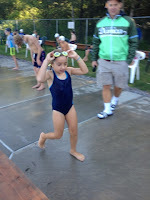 The race started at Moriello Pool. It was a freezing cold day, which made the water feel warmer. 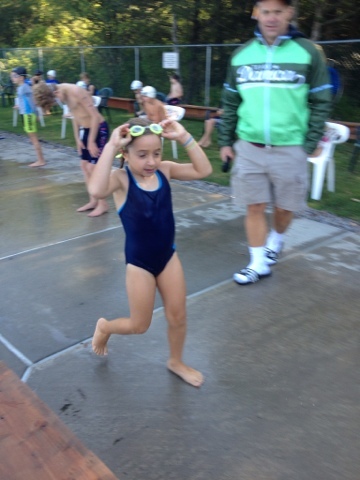 I swam four laps. Then I put on my shorts, race belt, and shoes, and started to run. After the swim, I felt wet and cold, and my hands were numb. I was tired! I ran down a hill and onto the Rail Trail. Then I went around a corner and into a big field. In the big field there were fences to show you the way. After that, I got on my bike and started biking. 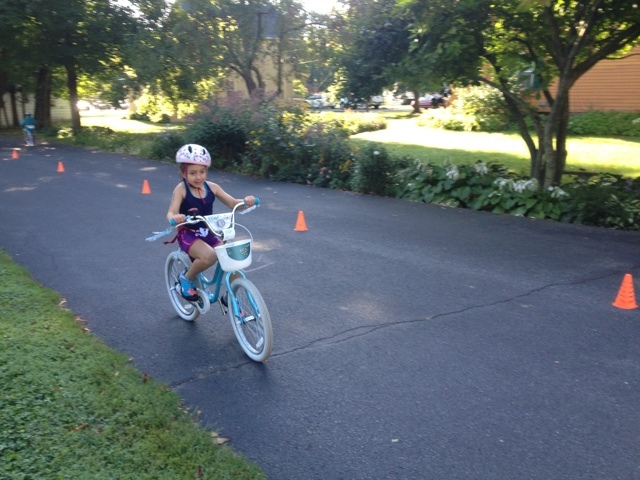 When I was biking, I sort of forgot that I was actually racing! So I biked slow, like I was just on the Rail Trail waiting for mommy and daddy. And then I got off my bike and I ran back through the fences in the field. Then I ran around a corner and there was the finish line. Everyone was cheering for me and that felt embarrassing but good. 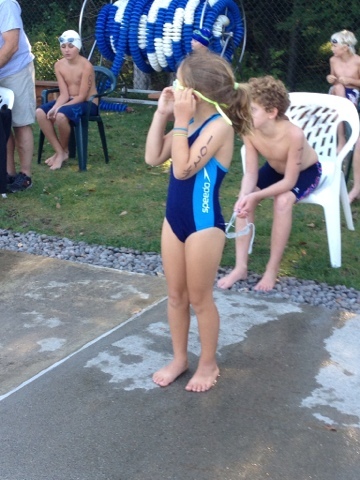 The hardest part of the race was running or swimming. At the end of the race I felt wobbly because my legs hurt. Then I had an ice pop and a bottle of water and I felt better. I liked the race a lot because I got a lot of energy and it was fun and I got to swim a lot. I want to do the race again but maybe in two years!